Category Archives for "Wedding Flowers"
It was a beautiful sunny February day just after Valentines when I delivered and set up Imogen and Adam’s wedding flowers at Hogarths Hotel in Solihull. 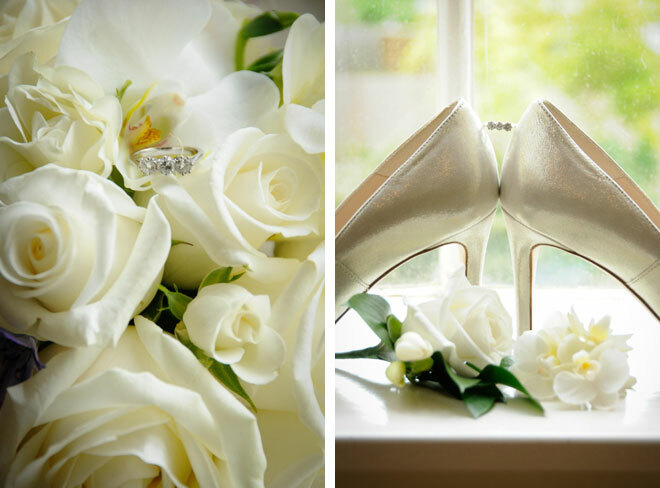 The couple went for a classic elegant flower theme of lilies and roses with a touch of sparkle. 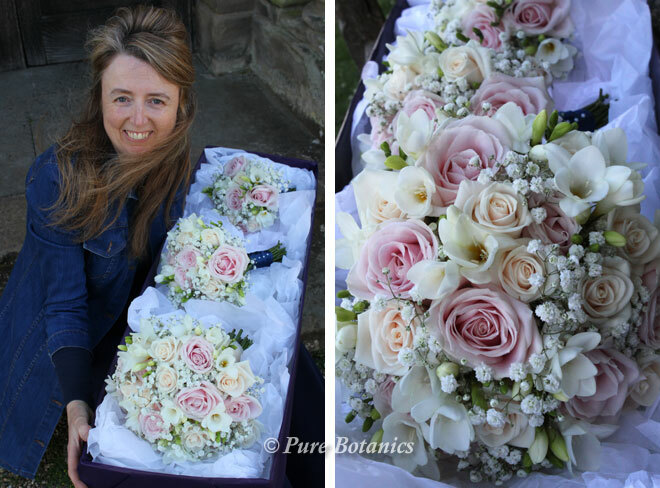 Imogen chose a bouquet full of ivory roses. 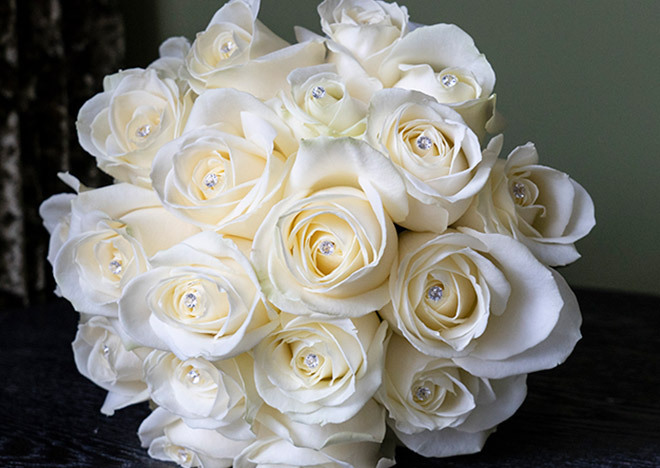 I carefully added diamante pins into the centre of every rose. 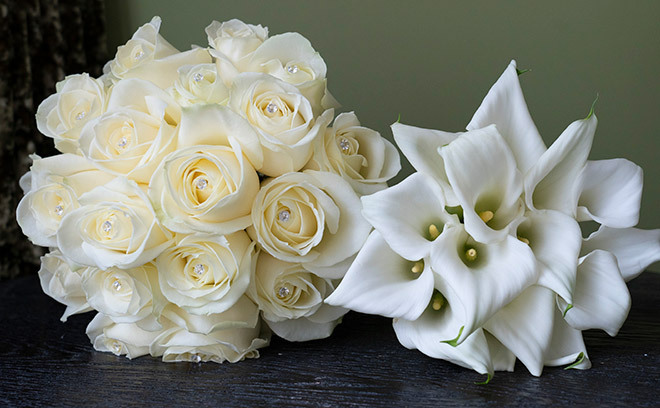 Her bridesmaids held ivory calla lily bouquets that I finished with a satin ribbon handle featuring diamante pins to match detailing on the bridal bouquet. The whole effect was simply stunning. 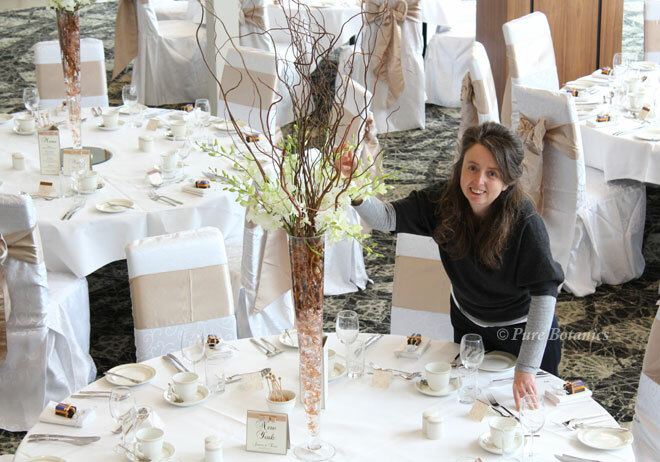 When I met Imogen and Adam at their consultation, they fell in love with one of my tall table centrepiece designs. We decided on a few alterations and came up with the design that you can see here. A mass of white oriental lilies sitting on a tall vase filled with gel balls and lit with underwater lights. 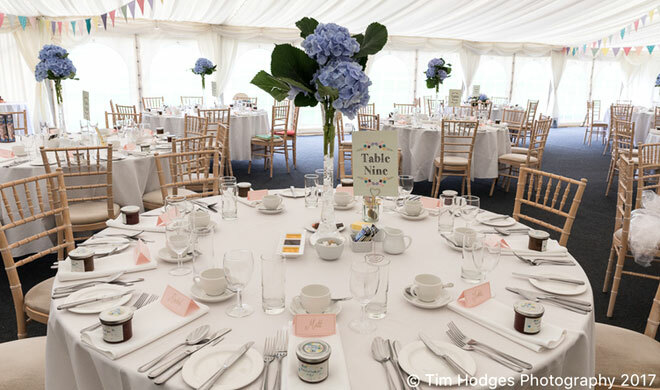 These centrepieces worked perfectly in the marquee at Hogarths. It took days of preparation to get the lilies to the exact right stage for these arrangements. As well as lots of plucking pollen to make sure it didn’t stain the petals. 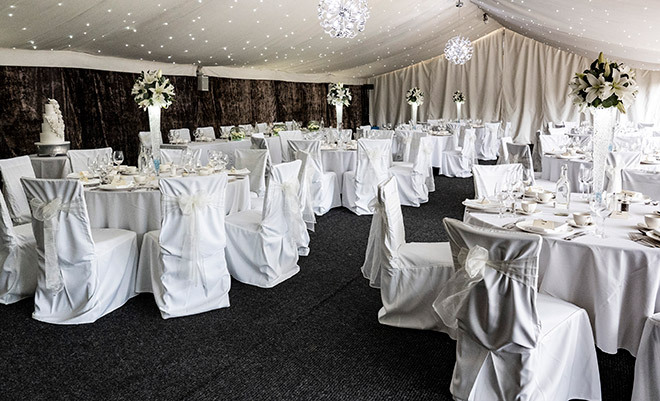 All that preparation was worth it as they looked fabulous and really transformed the marquee, as well as smelling wonderful. As the temperature rocketed we were busy cooling things down here at Pure Botanics. 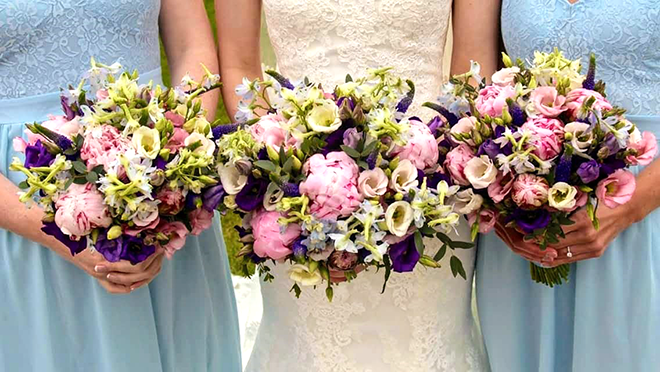 It has been our busiest July for weddings and without a doubt the hottest we have ever experienced, but I’m delighted that all the flowers went out as perfect and fresh as they always do. It was a fantastic summer for outdoor weddings. As this trend has really taken off now, we’re seeing more and more couples choose to be married outside. 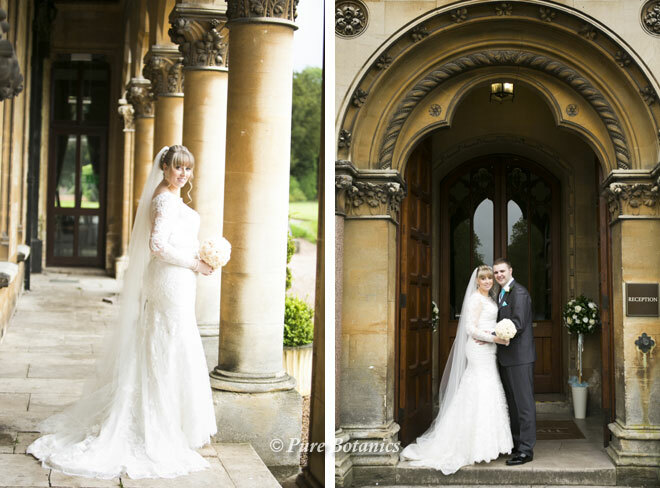 Below you can see Hannah and Anil’s outside wedding ceremony that I set up in the grounds of Coombe Abbey. This photograph was taken just before 11.00 in the morning as the couple were having a 12.00 ceremony. You can see the blue skies above and I can clearly remember the heat of the sun as we set the scene for a perfect outdoor wedding ceremony. 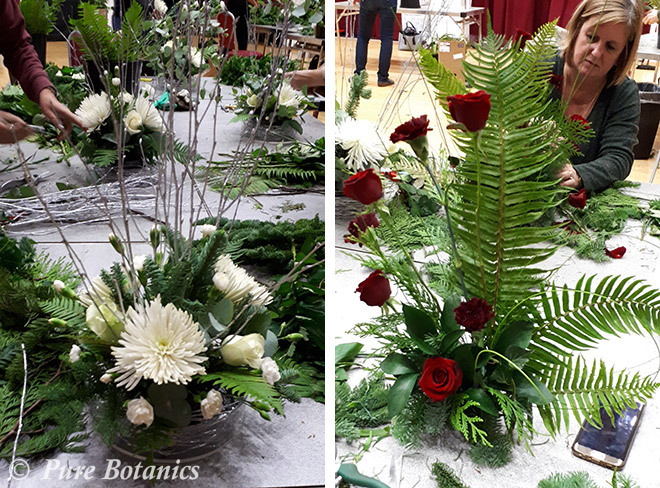 The couple chose to have beautiful large pedestal arrangements to mark the start of the aisle, these were followed up with two matching ones either side of the registrar’s table. 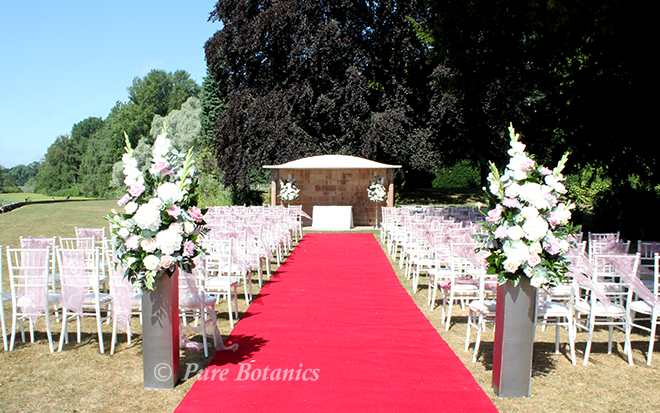 Pedestal arrangements really help to mark key areas of the ceremony and draw the eye down the aisle. 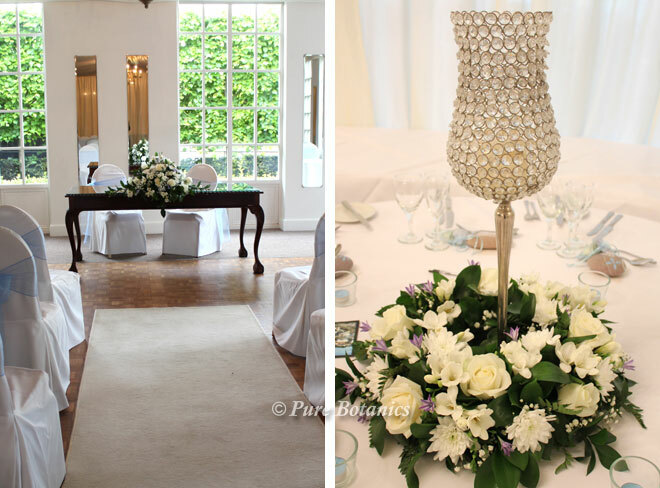 Here is what Hannah and Anil had to say about their wedding flowers that I created for them. I also remember how hot it was even early in the morning when I delivered Judith’s wedding flowers over to Brandon Hall Hotel (photo above). 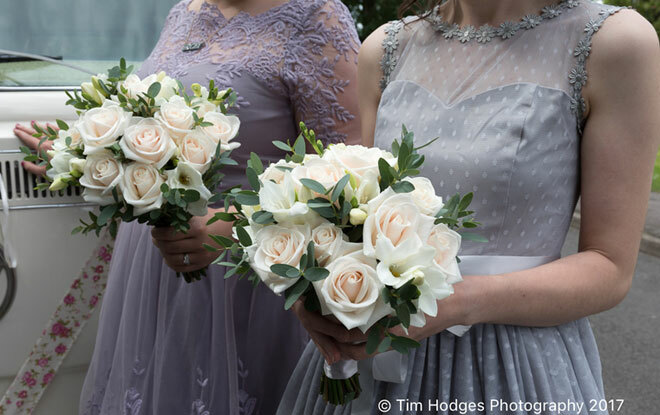 We have been liaising with venues making sure that there was somewhere cool to store the wedding bouquets and buttonholes during the hot weather. Most venues have a cellar, this proved to be a great place to store the bridal bouquets and buttonholes on the morning of the wedding. For our brides that were leaving from home we found cool spaces in areas like the garage or a spare room with the curtains closed. 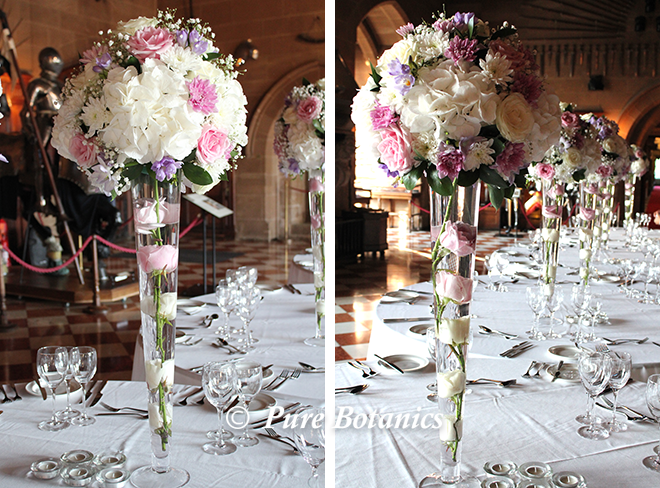 In the photo’s above you can see the stunning tall table centrepieces that I created for Jo and Jermaine’s wedding at Warwick Castle. All wedding flowers must be installed and finished by 10.00 a.m. at the castle so that we can be off site before the general public arrive. The Great Hall in the Castle is such an old building with thick stone wall it stays cool even with the incredible heat outside. 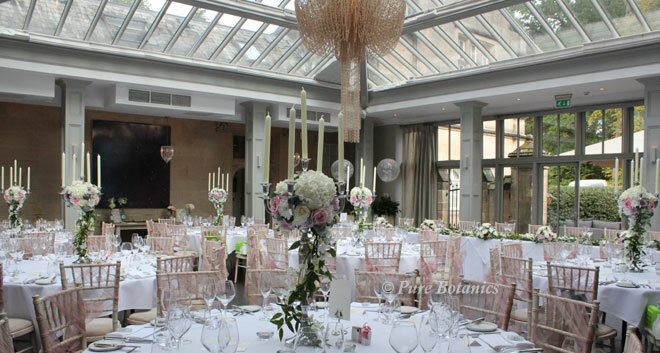 Our more modern wedding venues all had air conditioning that does absolutely no harm to the flowers. Jo and Jermaine had a wonderful wedding day and sent me this message about their flowers. So even though I might have got a little hot during the heat wave, I’m pleased to say that the flowers didn’t. I’m also really delighted for the couples that had their hearts set on an outdoor wedding, the English weather didn’t let them down. As weddings are becoming slightly less formal and couples opt for the more relaxed venues, the trend for less formal buttonholes has emerged. These new designs are perfect for those gents that are not keen on flowers that are too large or traditional. Here you can see a small selection of buttonhole designs that I’ve created for some of our customers. Above you can see a really delicate buttonhole featuring lavender and beautiful dusty miller silver foliage. I’ve finished the stem with white satin ribbon and bow detailing. If you are getting married outside, in a barn, tepee or a country wedding location you might be going for a rustic or woodland wedding theme. 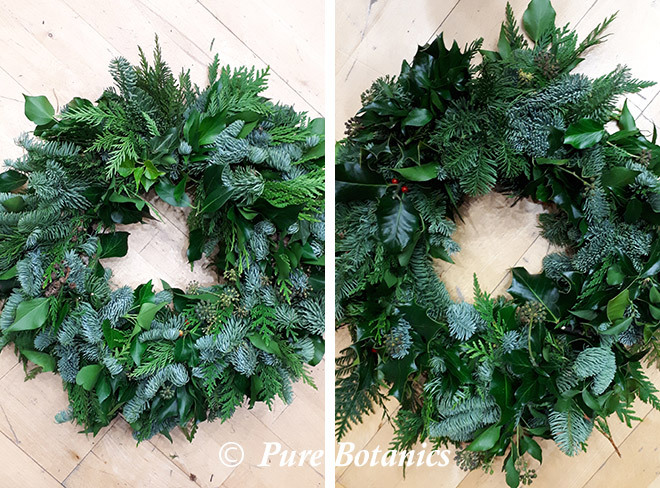 In the photo’s above and below you can see how I’ve added twigs, herbs, ferns and delicate flowers and herbs to create a small cluster buttonhole. They’ve been finished with brown raffia to give a natural look. 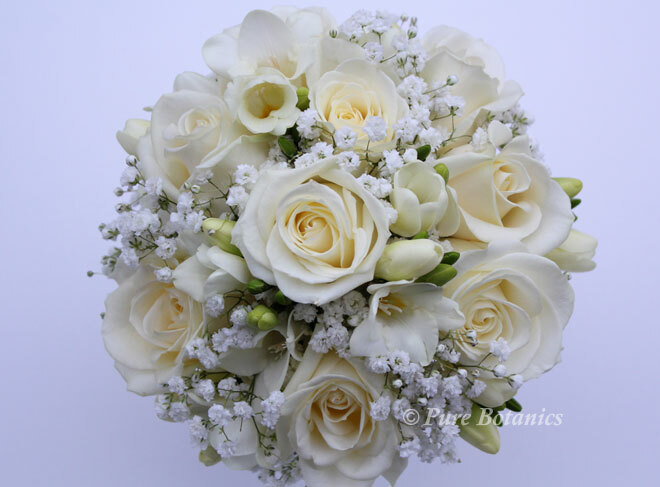 Gypsophila has been a really popular choice for wedding flowers over the last five years. Below you can see how I’ve incorporated into the gent’s buttonholes. It’s a great flower for small delicate buttonholes which are often popular with groom’s that don’t want too big a flower. It also works well when added to other flowers like the rose you can see here. I adore these little acorns that I backed with fern, rosemary, ivy and twigs for a rustic wedding held in a woodland setting. 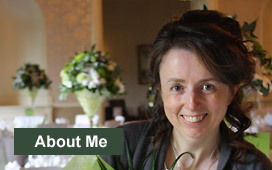 See more of our designs on our buttonhole’s page. 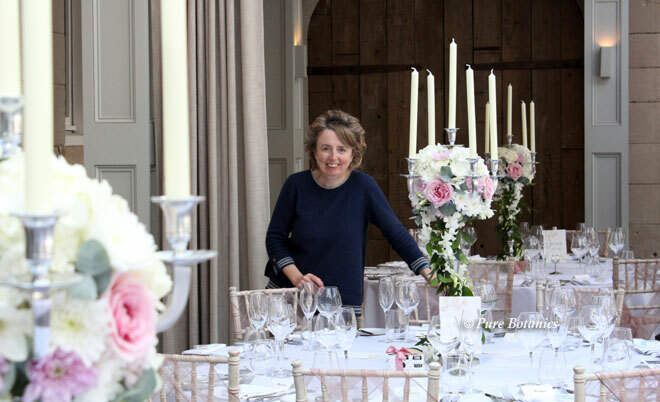 I’ve just published my great little guide on “How to Create the WOW Factor with Your Wedding Decorations”. 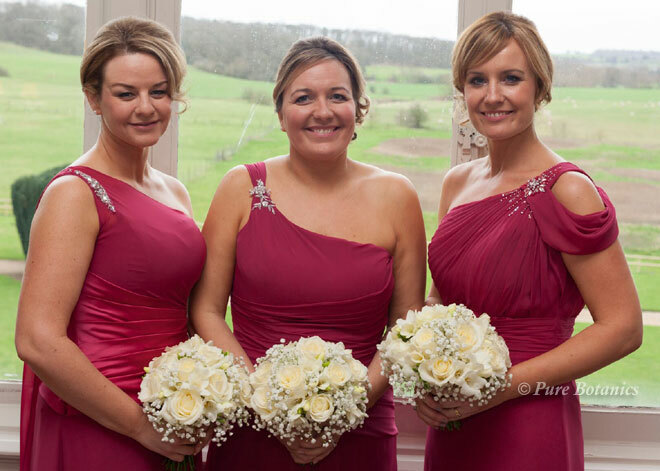 Time and time again we get feedback like this from our brides. 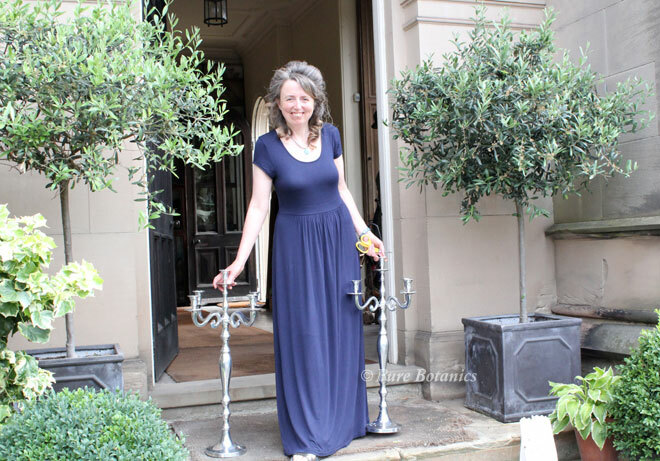 In this guide I share with you my secrets and tips on how to have the most amazing wedding decorations that will have all your guests talking …all on a realistic budget. 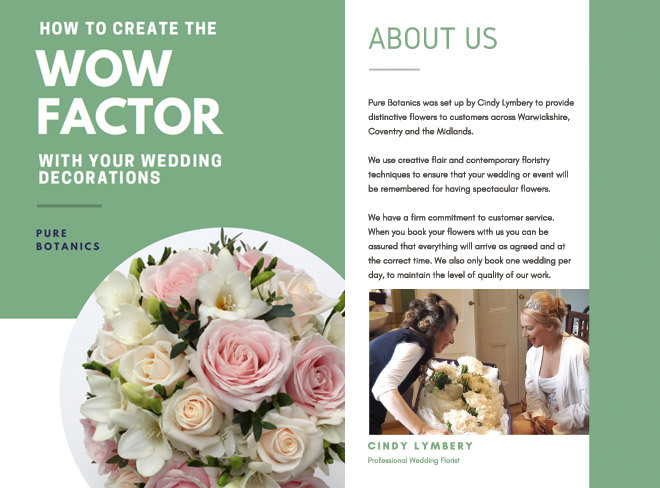 Download your free wedding guide that’s full of helpful hints and advice on planning your perfect wedding decorations. 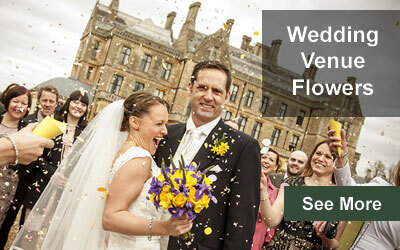 Excitement is mounting as we are busy talking to couples planning their wedding flowers for this year. There are definitely some trends emerging from what my clients are requesting. Here is my guide to what’s trending in wedding flowers for 2018. We saw a trend for more foliage last year and it is set to stay for 2018. 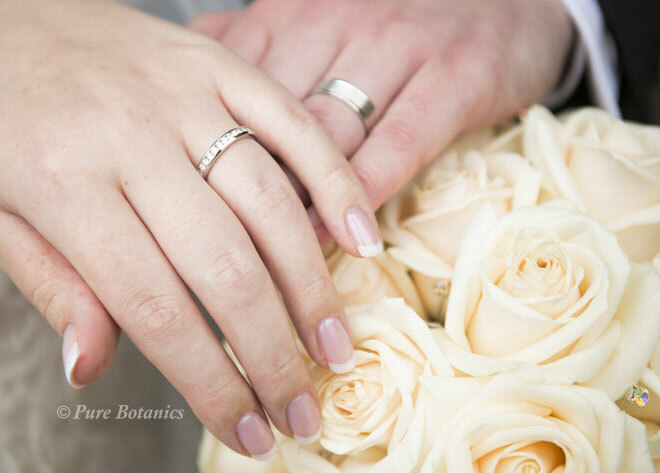 Brides are asking for more loose natural style bouquets with plenty of foliage. 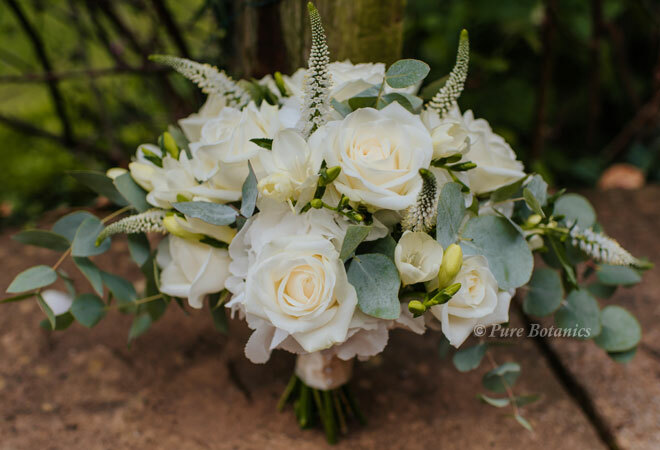 You can see in the photo above how Ella (the bride) chose to have lovely silver eucalyptus foliage in all her bridal bouquets. She asked me to create her bouquets with a natural loose style with an elegant and classic look. 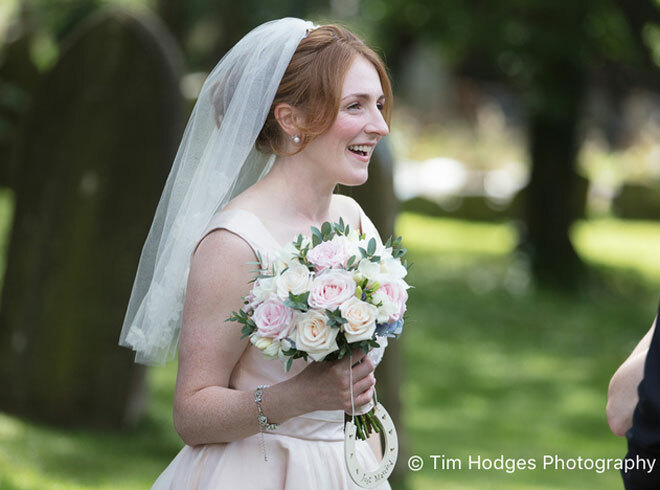 You can see more of Ella’s Wedding Flowers on our featured weddings page. Eucalyptus is increasingly popular, it’s a pretty soft greeny grey and smells wonderful. 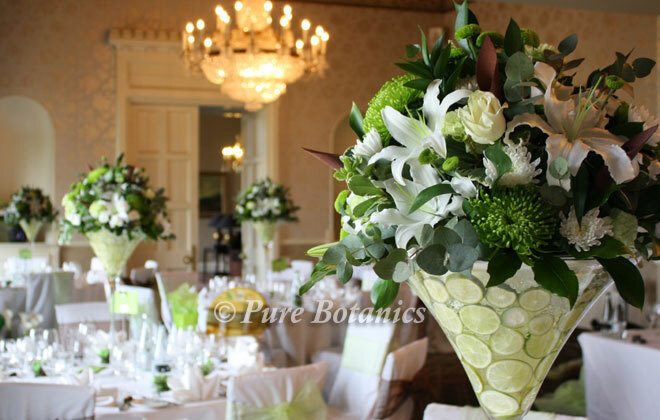 It works in all wedding flower arrangements and is particularly good in churches as it’s a lighter shade and stands out. 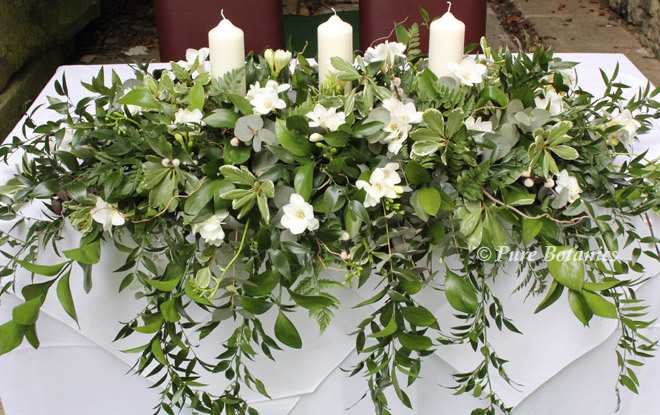 You can see here (photo above and below) how I’ve used lots of different types of foliage and white freesias to create this ‘Woodsy’ style arrangement for an outdoor wedding ceremony at Ettington Park. I incorporate twigs and moss to fit with the natural theme. As the guests walked across the lawn and up to the Long Gallery their path was marked by candlelight. This included these beautiful cascading floral arrangements (photo below) that I created on the staircase. 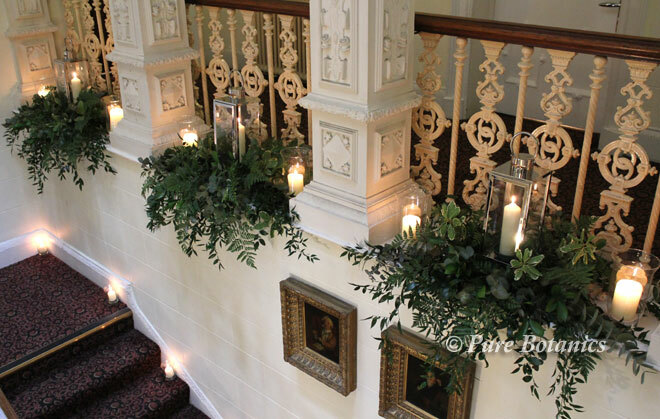 The couple wanted foliage that was rich and textured that fitted with the grand style of the venue décor. 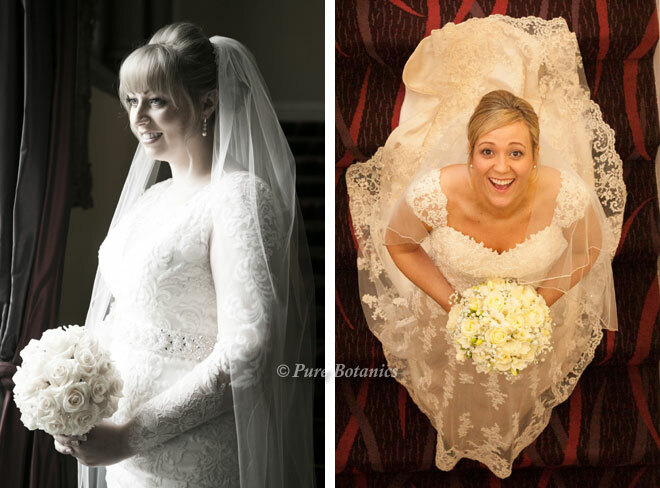 Having met with lots of brides this January, one thing that is coming up time and time again is texture. 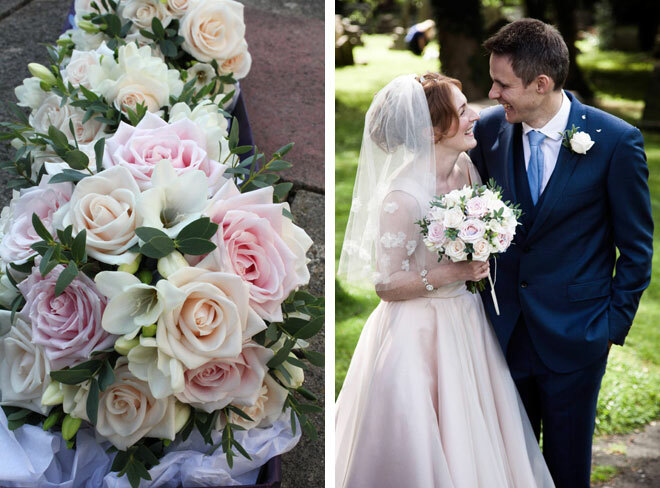 Three particular flowers that brides have chosen are Astilbe – the white fluffy flower you can see in the bouquet above and the pink one in the ceremony arrangement below. Astrantia – also known as pincushion flower, give a natural country feel and are the smaller white flowers in bouquet above. 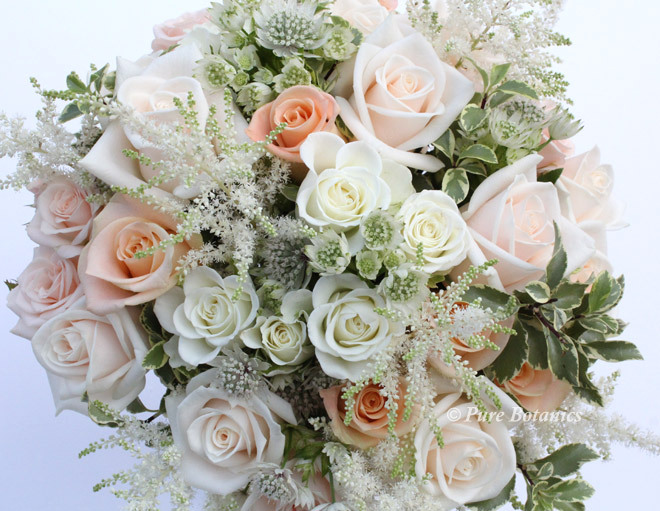 Still remaining popular is Gypsophila, that you can see in abundance packed into the arrangement below. 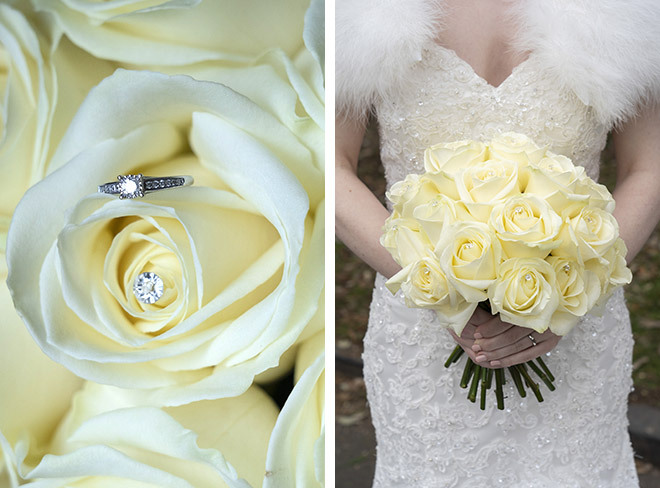 All three of these flowers will add texture to bouquets, buttonholes and arrangements. Last year we were working with lots of pale blush colours and classic ivories, this is also set to stay for 2018. 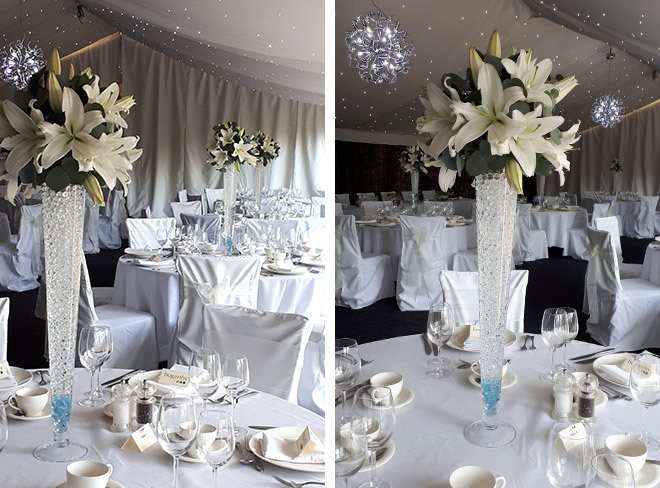 You can see how I created Gemma’s stunning bridal bouquets (above) and wedding centrepieces (below) at Hampton Manor below in this colour theme. 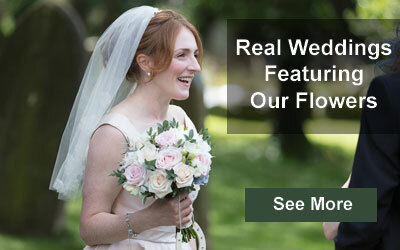 You can see all of Gemma and Olivers wedding flowers on our featured weddings page. 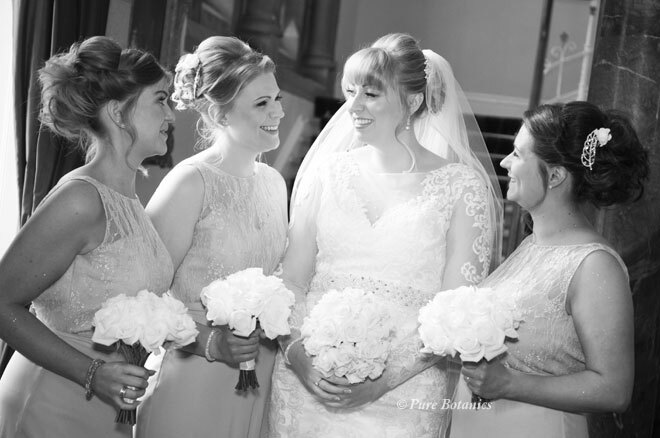 Like many of our brides, Justyna (seen here in the photo below) also went for the soft blush colour theme for her wedding at Warwick Castle. 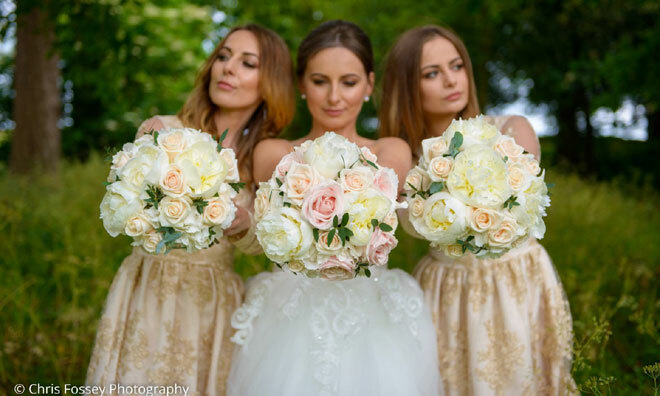 The creams and hints of peach worked perfectly with the soft gold of her bridesmaids’ bouquets. 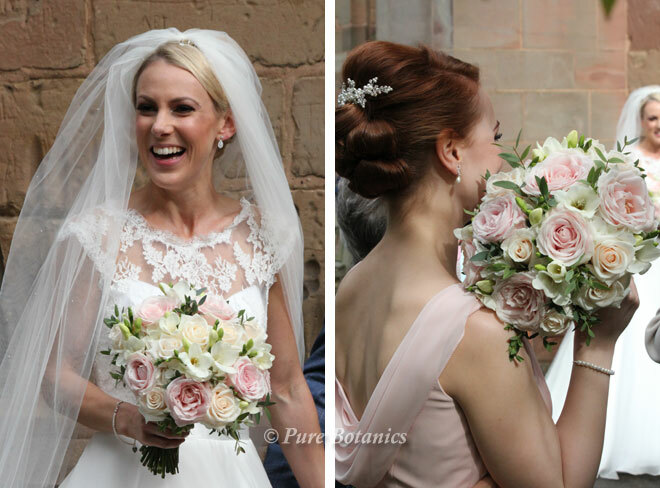 As this was a spring wedding she chose the popular peonies in blush pink and ivory. I combined these with hydrangeas and roses to give a very elegant look. 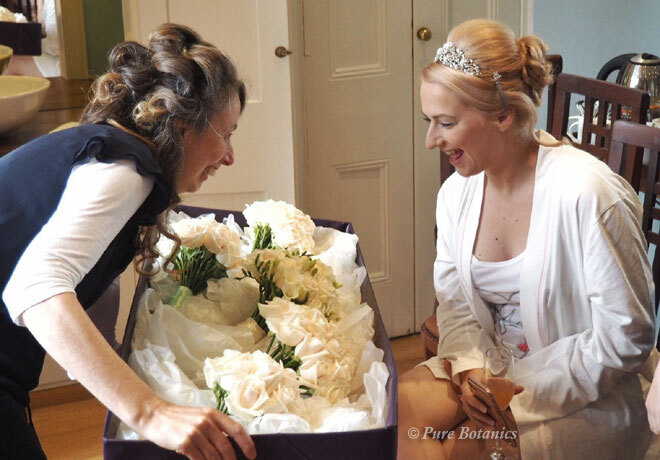 See more photos of Justyna’s Spring Wedding Flowers. I’ve been really enjoying creating new designs to fit with the trend for table runners. You will see lots of designs online that run down the centre of tressel tables. These are stunning if you are going for that type of table set up, however the majority of our couples are still choosing round tables. So I’ve been creating table runners to go along the front of the top table. 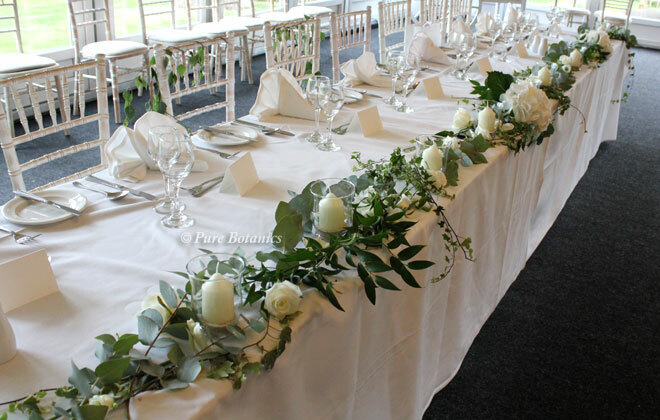 As top tables can be really quite long, the budget for a full solid table runner can be prohibitive so above you can see how I’ve created a similar look by using flower clusters linked with trailing ruscus leaves. 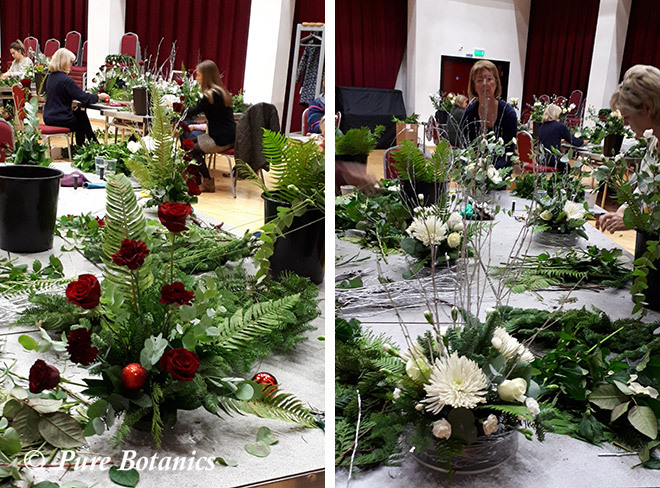 For a looser more natural look I created the one you can see here (above) that has a lots of different foliages twisting around mini hurricane vases and trailing down the front of the table. 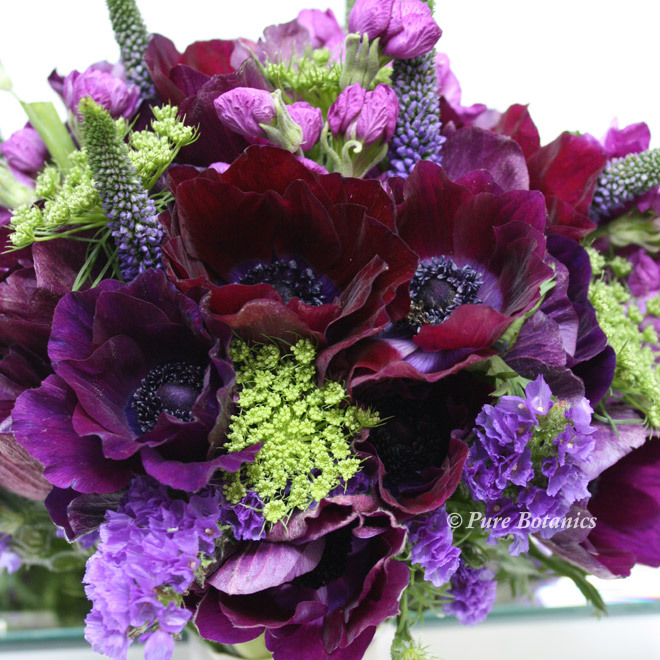 This seems to be the buzz word in wedding colours as we start the year with an emphasis on purples coming back into fashion. So we’ll see if this comes true. I’m definitely seeing flower colour choices fall into two distinctive categories either the blush and neutral or the deep rich purples and red so there might be something in the predictions. It’s always wonderful to see patterns and trends emerging from our clients and we always like to stay ahead of the fashions. 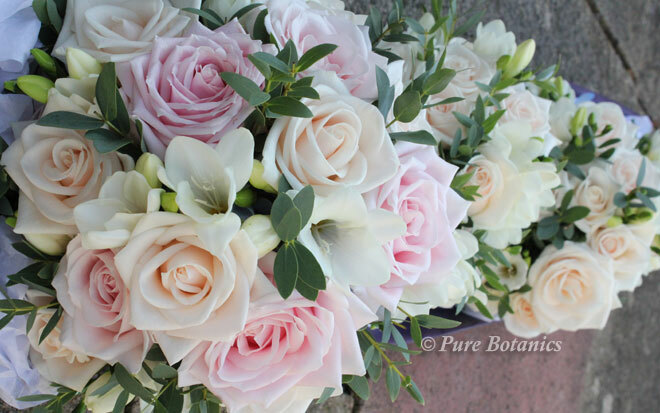 But don’t be a slave to them, go for colours and flowers that suit you as a couple and fit with your look and style of wedding and I look forward to helping many of you achieve your perfect wedding flowers this year. 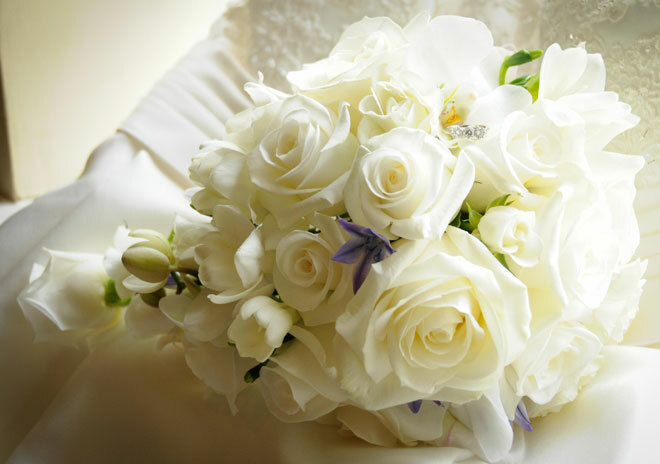 Please contact me for a free consultation to discuss your wedding flowers for this year or next. 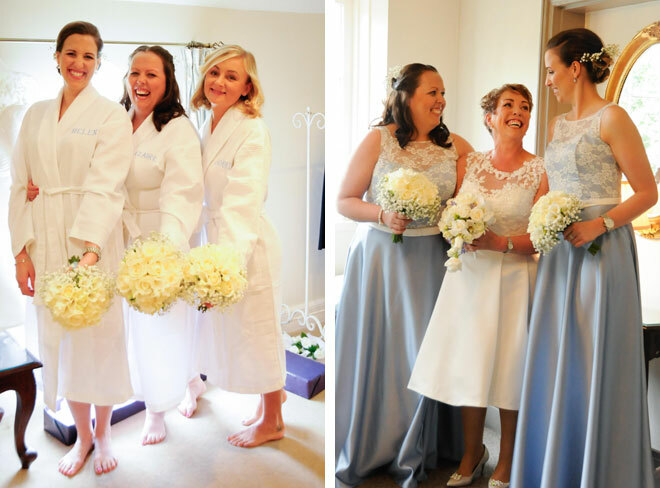 Every wedding is different and each couple is always going to want to create their own unique look, style and atmosphere to their wedding day. Some people need a little help and guidance but others like Jill and Jem have a clear idea of what they want to achieve right from the start. 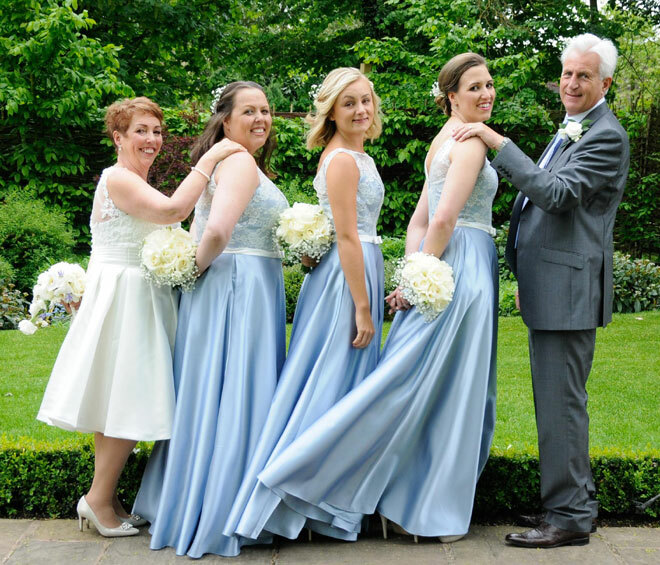 The couple, with the help of their daughters, created the perfect balance of beautifully coordinated with a relaxed and joyous atmosphere. 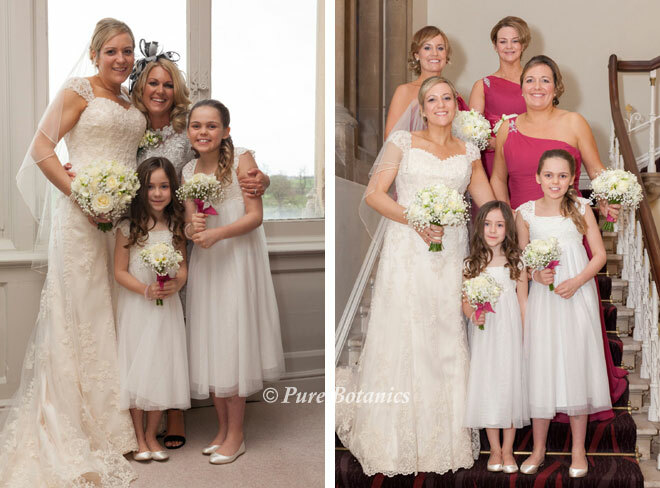 The choice of flowers that were made by the whole family worked wonderfully. 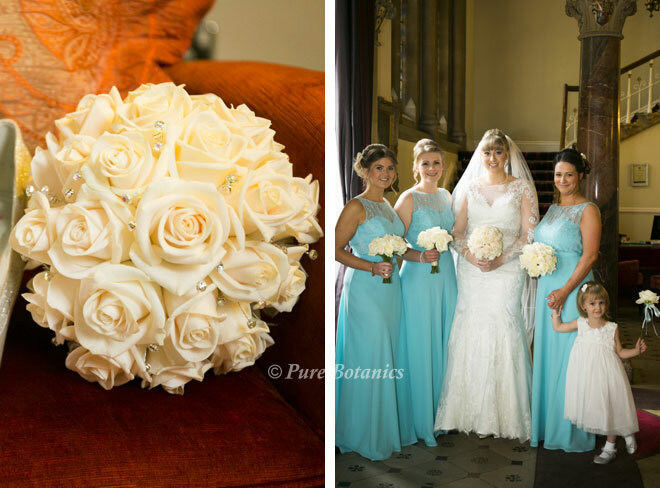 I think classic ivory works beautifully with the pale blue. 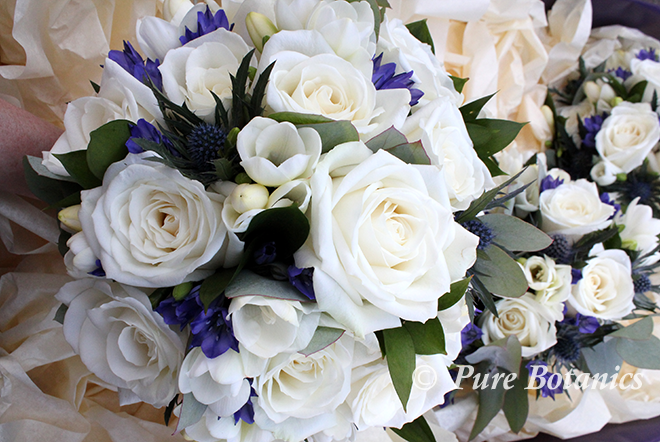 I also like the hint of blue in Jill’s bridal bouquet, it just gives that subtle link without overpowering the fresh look. 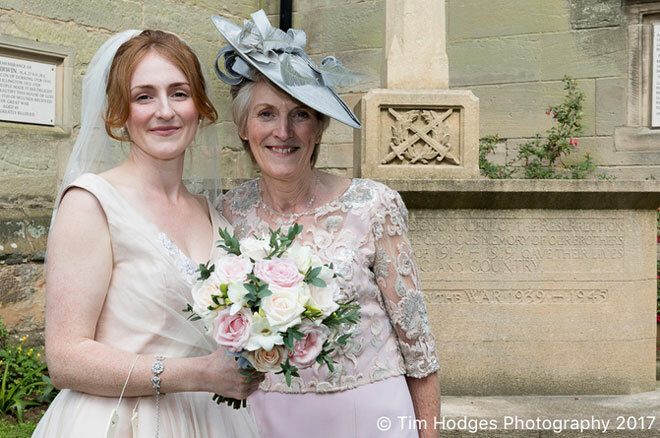 Roses, orchids and freesias are glorious when creating bouquets with elegance and classic style and I think you’ll agree that’s what I managed to do with Jill’s bouquet (photo above). 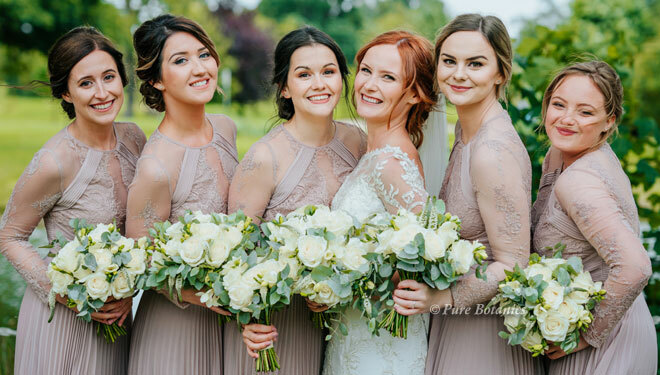 Picking up the gypsophila for the bridesmaids’ echoed the beautiful lace detail on their dresses and gave their bouquets a modern touch as gypsophila really has been a highly fashionable flower recently. 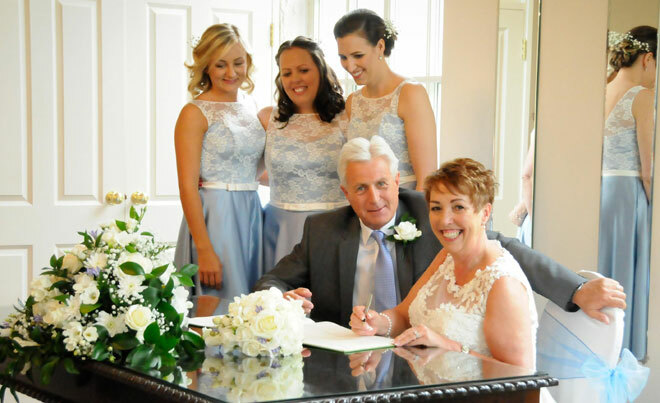 If you’re planning a civil ceremony it’s a good idea to use your top table on the registrar’s table for the wedding ceremony. 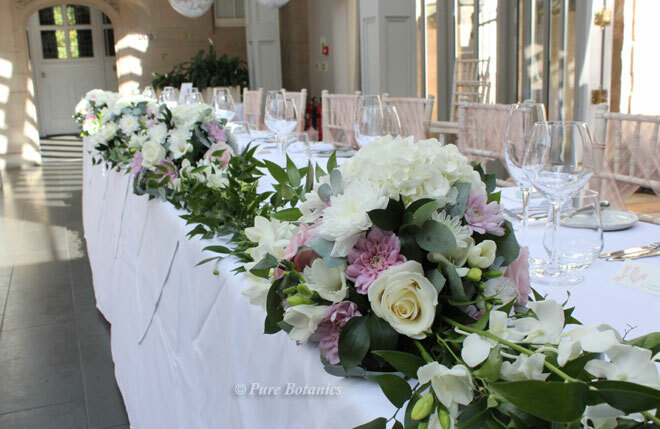 It can then easily be moved over to the top table for the wedding breakfast. 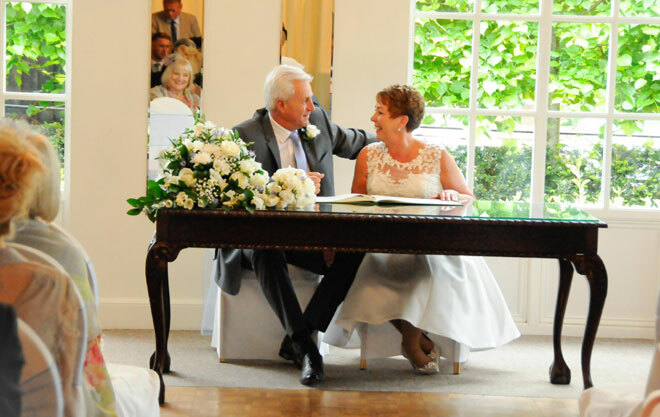 Be sure to take a look at more of the photos and information about Jill and Jem’s fabulous wedding at Warwick House on our featured wedding page.